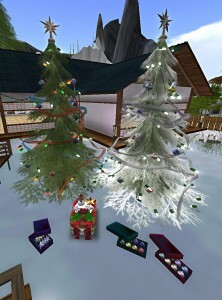 New Ornaments and Trees for the holiday season! 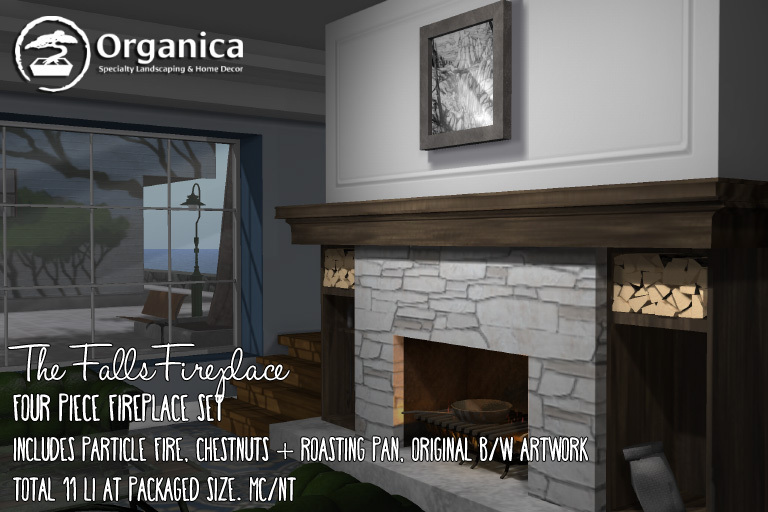 New Fireplace & Winter holiday items now available! 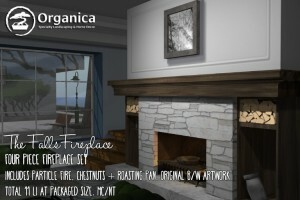 New this week is a four piece fireplace set called The Falls! It includes a poker set, chestnuts with a roasting pan, fireplace, as well as original artwork called ‘The Falls’, by me (Aki Shichiroji / Florence Chan). Pick it up for only L$200 via The Neighbourhood promotion this weekend! 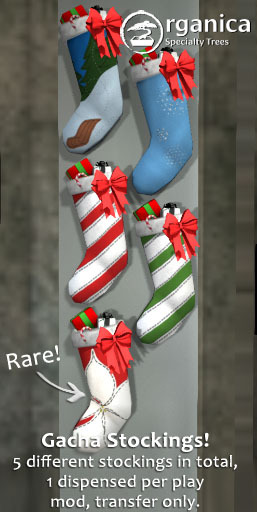 Winter holiday items are also back! 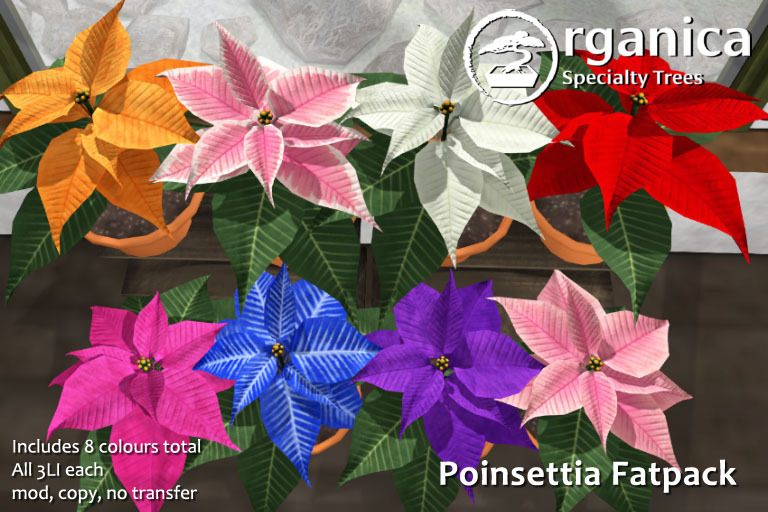 To help celebrate the festive season, these new mesh poinsettias are now available – and for one day only, 50% off! 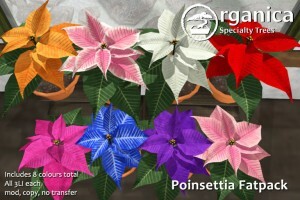 Each package contains two versions – one with and one without a pot. All copies are mod, copy and are 3LI. 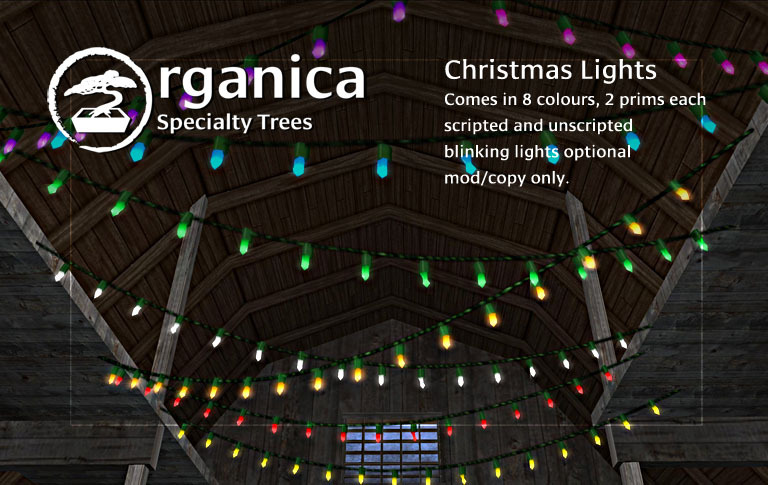 Pop by the main store in Organica to see them in person, or check them out on Marketplace! 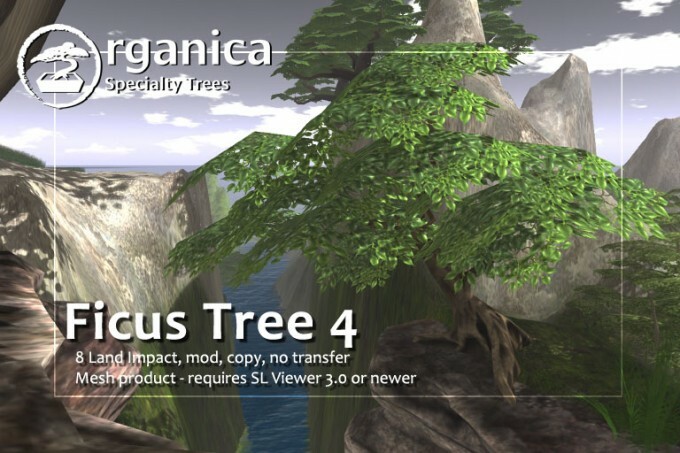 Gacha Items make their way to Organica today! 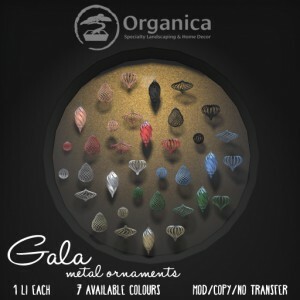 For the first time ever, Organica’s offering gacha or ‘gachapon’ items! Three sets are available and it costs L$50 per play. 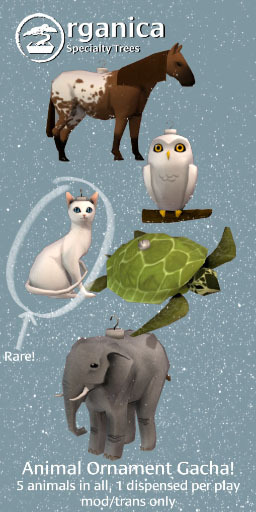 All items are mod/transfer and one item in each set is rare! These gacha machines will be on hand for the duration of winter, after which they’ll get packed away for the year. Items from Around The World have finally made it to the main store; as a reminder, that’s the Avant couches and armchairs, the After Malevich coffee table, the Menagerie Nesting Dolls and the framed Suprematist art prints. 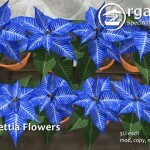 They’re available in store only for now – Updates will be made to the marketplace upon available time. 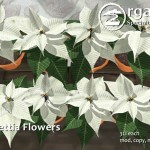 They are divided by foliage type – deciduous (leafy) and coniferous (needle). 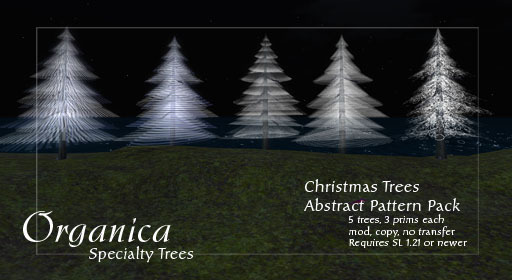 Each pack comes with seven trees plus frosted grass. All items are sculptie. Please note: These two packs are offered as is. No updates for items contained within these two packs will be sent out unless there is some defect. 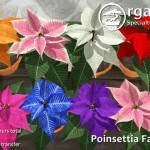 Christmas tree ornaments return to the store and will probably hang around until mid-January before they are put away for another year – they come in two varieties – star and tapered, eight colours to a box. All are mod/copy. 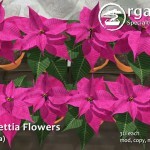 Check out the store for some holiday freebies as well! Two Christmas trees, available in green and frosted, are now available for sale! 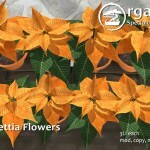 They are mod/copy and feature sculpted ornaments, garland, lights, and star on top! Additionally, the ornaments are also available seperately; There’s a set of star ornaments and two sets (one bright, one pastel) of tapered ball ornaments available! 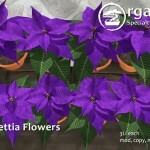 Some of last year’s selections are also available. 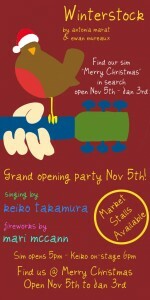 Everything is on display out in front of the store, so do drop on by! Winter updates have been made to the Alder Grove 1, Stepping Stone and Stone Wall items! If you bought these items prior to today, you should have received updates for them. 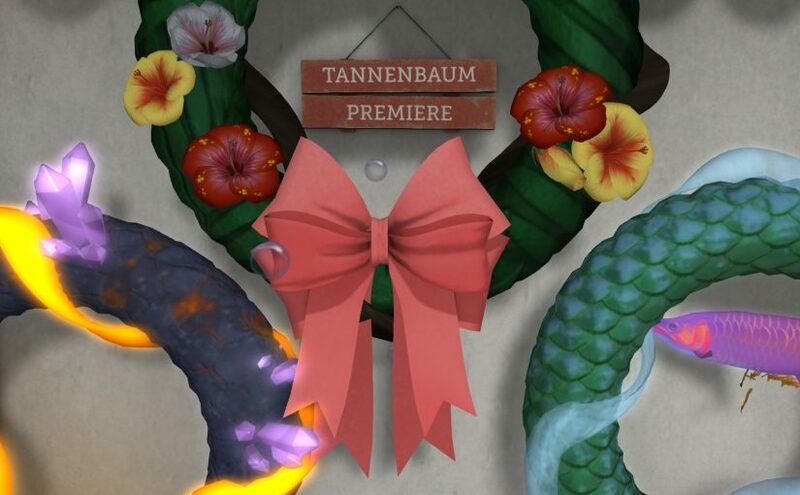 If you did not receive the update, please contact me with either a transaction number for the item or a screenshot of the item in edit mode, with user interface showing so that I can verify your purchase! This stone pavilion is the perfect centerpiece for your garden! 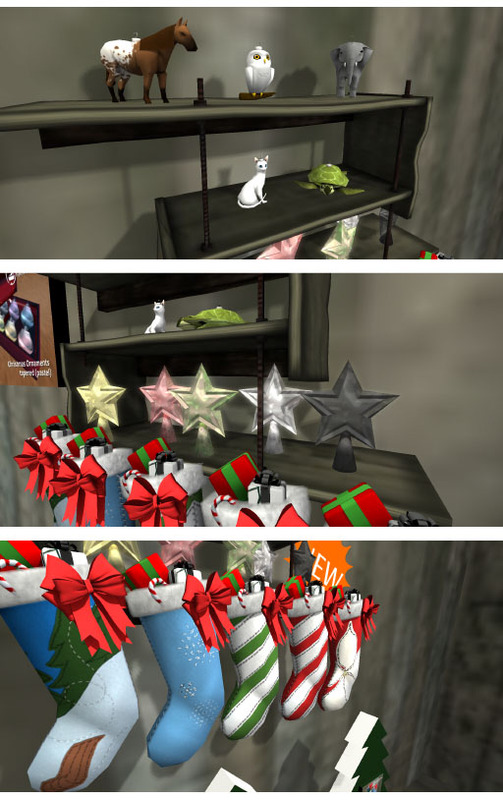 24 prims, party lights sold separately (see below). Please note: As this item uses a rez-faux to properly position your item, the initial package delivered will be copy only! You must place, rez, and finalize the rezzer before the rez-faux scripts can be deleted from the build components to allow for a fully mod/copy build. 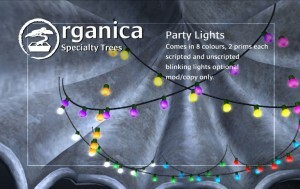 These party lights are strands of multiple round bulbs, offered in 8 different colours. 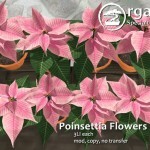 They’re great not only for the festive season but in pretty much any environment you choose. 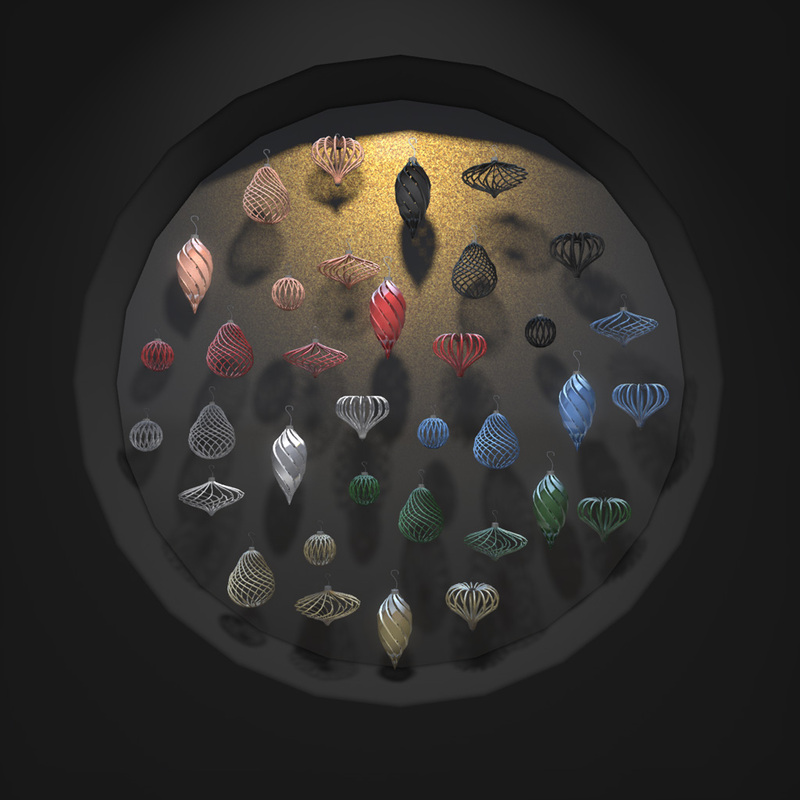 They come scripted and unscripted (for texture change). You can also add the optional blinking script to make the lights flash on and off if you wish. 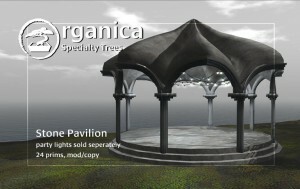 Offered mod/copy only. Scripts are copy only. 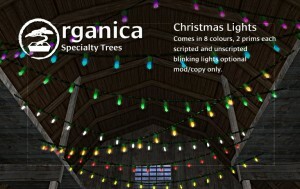 These Christmas lights are strands of multiple flame shaped bulbs, offered in 8 different colours. 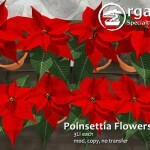 They’re great not only for the festive season but in pretty much any environment you choose. 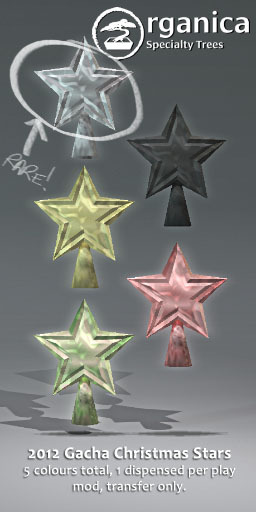 They come scripted and unscripted (for texture change). 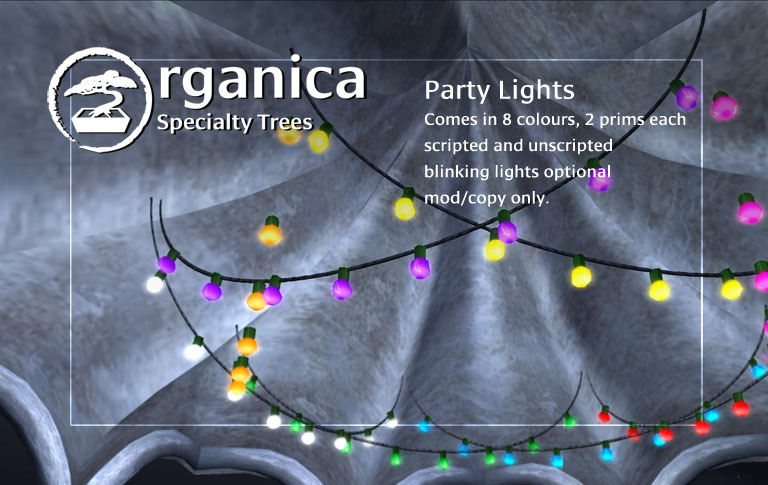 You can also add the optional blinking script to make the lights flash on and off if you wish. 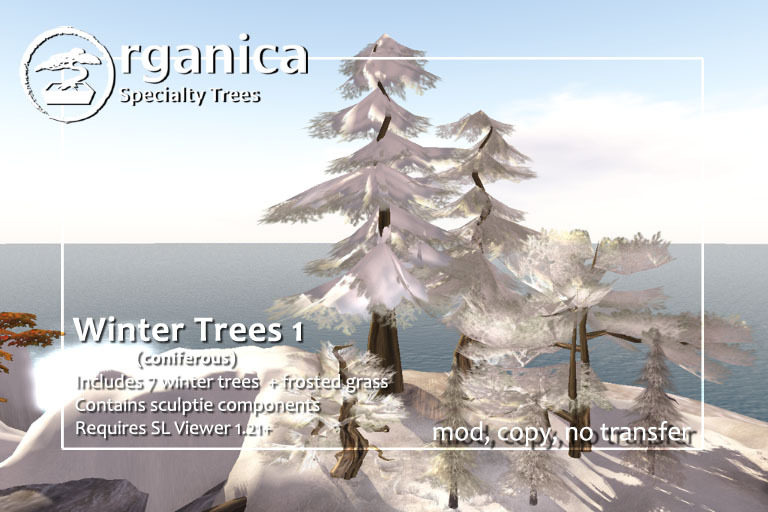 Offered mod/copy only. Scripts are copy only. 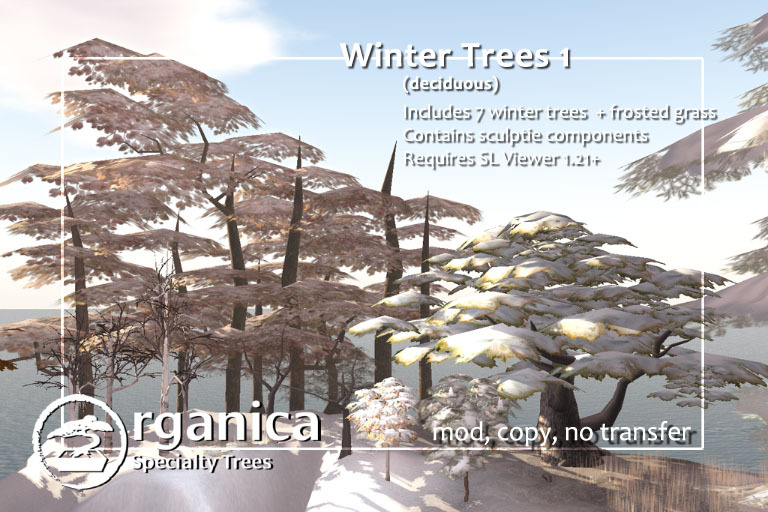 Organica will be participating in Winterstock this year! 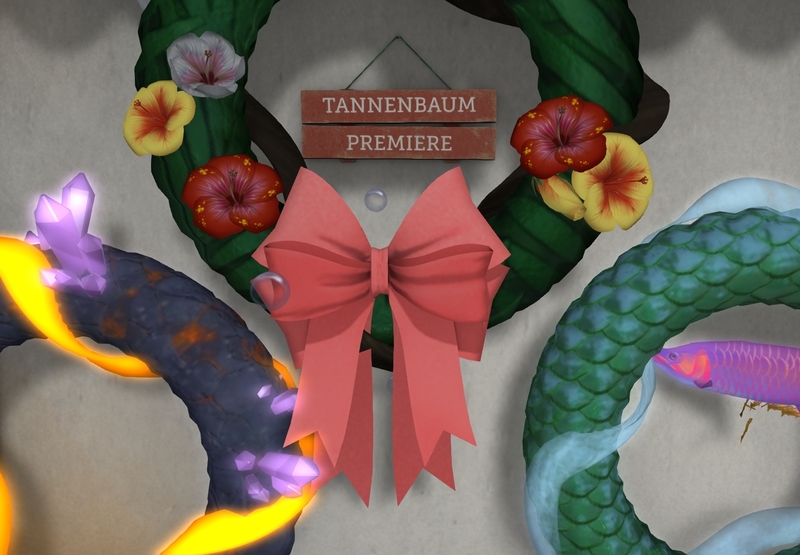 Various new and coming holiday offerings will be available here for about a week to help promote the opening of the event, and will be placed at the main store after that point. These are the first of a set of offerings that are on the way from Organica, along with some big changes and releases (hopefully) coming soon, pending available time. 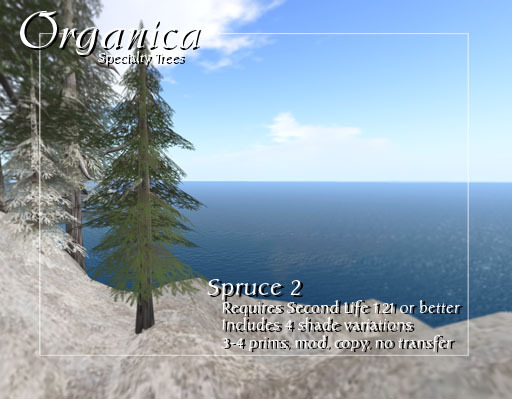 The new spruce trees feature all new sculpts and textures and are between 3-4 prims each. The abstract pattern trees are new sculpts and textures, and are available either individually or by pack of all five. 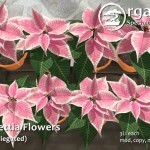 As always, these offerings are copy/mod.